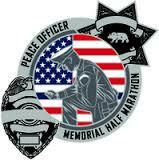 In 2002 the Peace Officer Memorial Group of Stanislaus County (POMG) was formed. Since its inception, the primary goals of this non-profit organization have been to educate the public about officers who die in the line of duty, to support and assist the families of fallen officers, and to raise public awareness of the Stanislaus County, State and National memorials for fallen officers. In 2003 POMG organzied the first Peace Officer Memorial “Foot Pursuit” consisting of a 10K, 5K and 1 mile run/walk, to celebrate and honor the fallen officers of Stanislaus County. In 2011 POMG expanded the race to a Half Marathon, 5K and Kids Fun Run, furthering the goal of honoring our counties fallen police officers. In 2017 we added the (Record Setting) Full Gear Challenge along with the Relay Option. The start line, finish line and each mile of the half marathon have markers in memory of one of our counties 17 fallen officers. The half marathon course also highlights many jewels of Modesto including the Gallo Center for the Arts, the McHenry Museum and Mansion, Dry Creek Park, Graceda Park and the beautiful College area. This fast, flat and scenic course is a draw for runners throughout the region. In addition to the race festivities, a safety faire and race day expo are held near the start/finish line at the corner of 11th and I St in downtown Modesto. The faire includes vendors, Crime Prevention Officers, police K-9 demonstrations, SWAT Team personnel, equestrian units, McGruff the Crime Dog and much more. This event is more than just a race, it is a fun filled family event that has become an embedded event in the community. Proceeds from the event will benefit the families of fallen officers as well as help raise awareness of and fund peace officer memorials. Thank you for supporting POMG and this event. 6:45 am- The event will start with a short ceremony honoring the 17 fallen officers who have paid the ultimate price in Stanislaus County. The half marathon course is flat, fast and will highlight many jewels of Modesto. The race start/finish line is located in front of the picturesque Gallo Center for the Arts where pictures of fallen officers will be displayed on their giant LCD screen. Runners will be treated to an opening ceremony that includes the presentation of colors by law enforcement color guard units and bag pipers playing amazing grace. Once the race begins it will make its way through downtown and into the scenic college area. After running by Modesto Junior College and into the shaded residential neighborhoods of the college area runners will locate their first aide station at well the popular Graceda Park. Once refueling, participants make a brief reappearance downtown to pass by the McHenry Mansion and McHenry Museum. The course then flows into wooded Dry Creek Park where music and another aide station will keep runners motivated. Runners will exit the Park at McClure Dr and make their way to Claus Rd and then onto Scenic Dr. Runners then make their way back into Dry Creek Park and through downtown where there will be no mistaking the finish line. A Fire Department ladder truck will be waving a 50 foot American flag over the finish line to motivate runners to finish strong. Click here to view the half marathon course. The 5K course will follow the half marathon route until the participants return downtown during the second mile of the race. Runners will turn right onto F St and follow 14th St back to I St where they will glide to the amazing finish line. Click here to view the 5K course. The Kids Fun Run is sure to be a blast! One of our local police chiefs will be on hand to deputize the participants of this race so they can have the proper credentials to “Catch the Crook.” Our crook will be dressed in a black and white jail outfit and there is no doubt these junior police officers will make sure justice prevails. This course will be approximately a half mile long and participants must be 12 years or younger. Parents are welcome to run with their children. The course will feature several entertainment groups ranging from spirit squads, school bands, and local bands. All water stations on the course will be single sided and will have medical personnel and portable toilets at each location. For your safety and for the timely reopen of the streets to vehicular traffic, you must reach key locations by specified times (equivalent to a 18 minute per mile pace) or you will be required to move to the sidewalk and follow all traffic laws. The Back of the Pack Crew and SAG Wagon will signify the end of the field and the maximum 18 minutes per mile pace. They will not start timing until the last person crosses the start line and will be with you throughout the race. If you cannot keep pace, the crew will help you as you board the SAG Wagon or move to the side of the road. Packet pick up will be held on Saturday, October 5, 2019 at Get-Fit Modesto 2801 Mc Henry Suite D, Modesto Ca 95350 from 10am-5pm. Here, you will pick up your goodie bag, race bib and tech shirt. If you are unable to make the packet pick up, you can pick up your packet at the registration table the morning of the race. Make sure to come early to avoid long lines and a late start.